The Ashaway Rally 21 Fire badminton string is made of Beta Polymer for increased strength and elasticity and features a multifilament core. It offers a gauge of 0.70mm (21 micro gauge) and has been designed for all-round players. The string ensures minimum tension loss, as well as enhanced durability and added power. It is supplied as a 10m (33ft) set. for submitting product information about Ashaway Rally 21 Fire Badminton String Set We aim to answer all questions within 2-3 days. 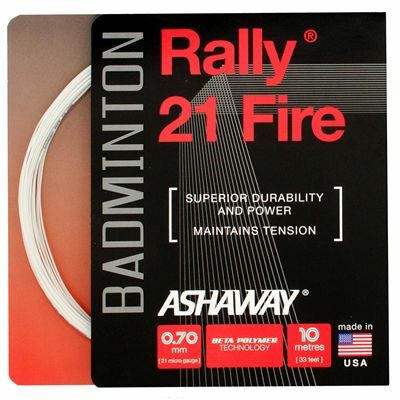 for submitting product information about Ashaway Rally 21 Fire Badminton String Set. We aim to answer all questions within 2-3 days. If you provided your name and email address, we will email you as soon as the answer is published. for submitting product review about Ashaway Rally 21 Fire Badminton String Set.